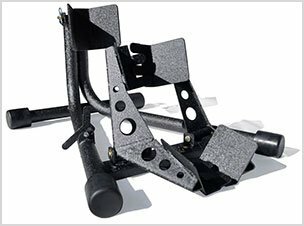 Finding a high quality floor jack is quite essential as it can help you in doing most of the routine maintenance tasks on your vehicle. With a Powerzone 380044 floor jack, you will be able to accomplish so much and you can fully rely on it. This is a good quality hydraulic floor jack, with so many amazing features that will serve your needs effectively, whether you own a home garage or an auto shop. Here is a simple guide that will help you make an informed decision about this particular model and a detailed review of each of the features that it has. The Powerzone 380044 is one of the top rated floor jack on the market, especially due to the fact that it is a heavy duty floor jack. It has become quite popular as a 3 ton floor jack, with most people preferring it due to the high rating and affordable price. There are some people who have judged it wrong due to the fact that it is made from China, but once you buy it you will be amazed by the incredible features. 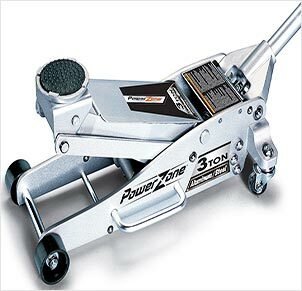 This Powerzone 380044 3 ton aluminum and steel garage jack is made of steel and aluminum. This makes it quite light, yet sturdy enough to last for a very period of time. This floor jack can support loads of up to 3 tons, without a problem and the lifting arm is solid as it is made of steel. It has a light weight of 60 pounds. With a minimum height of 4 inches, this can also serve most of the lowered vehicles without much difficulty. The maximum height is 18.25 inches, which means that the hydraulic floor jack can be used for most types of vehicle. The saddle is padded and this will prevent damages when using the hydraulic car jack. The two piece handle makes it easier to pump the floor jack and the fact that it can be dismantled makes it easier to store. The safety valve which prevents overloading of the floor jack beyond the rated capacity. The Powerzone floor jack is quite light due to its aluminum construction, it weighs 60 pounds but has the capacity to lift loads of up to 3 tons. 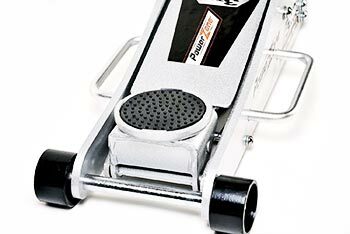 The lifting range of this floor jack is 4 inches to 18 ¼ inches and as such, you can use it on most vehicles, from lowered models to high vehicles. 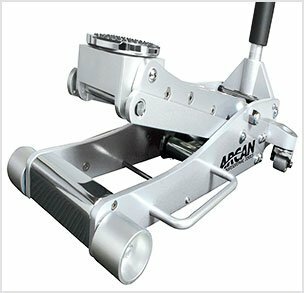 There is a quick lifting system on this aluminum floor jack, which makes it possible to lift loads with minimum effort. The saddle is rubber padded as a protection mechanism for the frame of the vehicle and other components on the underside. This also enhances the grip with the load and prevents slippage. 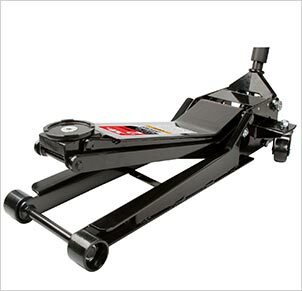 This Powerzone 3 ton floor jack has rear swivel wheels, which will make it easier to position the floor jack. Why Should You Buy the Powerzone 380044? While there are so many different types of 3 ton floor jacks on the market, the Powerzone floor jack has been ranked quite high. If you are not sure if it is the right model, here are some reasons why you should consider buying it. This is a garage jack that can be used for any professional mechanic and car owner. 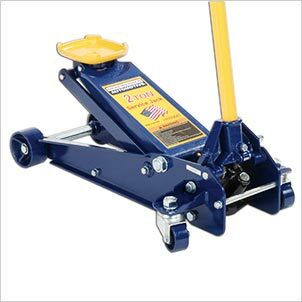 The Powerzone 380044 3 ton steel and aluminum floor jack is reliable due to its unique construction. It has an aluminum frame, which makes it quite light, yet durable. On the other hand, the lift arm is made of high quality steel, which will last for a very long time and enhances the overall stability of the floor jack. The aluminum floor jack has a quick lifting mechanism, which allows you to get the load to the maximum height with about 6 pumps. This is quite impressive as it will save you the time and energy when lifting loads. In addition to this, the hydraulic car jack has a safety valve, which will protect it from any cases of overloading beyond the rated weight capacity. 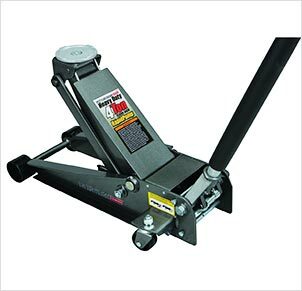 The 3 ton jack has the capacity to lift loads of up to 3 tons, while it only weighs 60 pounds. This is incredible when you compare to other models. 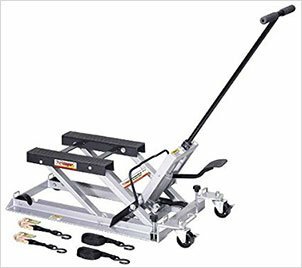 For instance, the Hein Wiener 3 ton floor jack weighs about 120 pounds, which is twice the weight of the Powerzone 3 ton floor jack. Other models are quite heavy so as to be able to lift 3 tons of load, but this particular one has surpassed this expectation. There are so many remarkable features which you should use as the main reason to buy this hydraulic floor jack. For instance, the floor jack has a saddle that swivels at 360°, making it easier to position the floor jack. 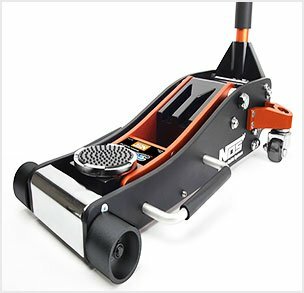 The fixed wheels are the front help in the movement of the floor jack, which the rear swivel casters will help you maneuver with ease and positioning of the floor jack. You can lift vehicles from 4 inches all the way up to 18 ¼ inches, which accommodates most types of vehicles, including the lowered ones. If you are looking for a high quality aluminum floor jack, then this is the right model to purchase. It is made in China, which makes it relatively cheaper than other models on the market. However, you should confuse the low price with low quality in terms of performance; it is highly effective in terms of its performance. How to Operate the Powerzone 380044? Close the valve of the floor jack, which will be done by turning the handle of the floor jack in the clockwise direction. Turn it until it is completely tight. Start pumping the floor jack in slow motions and keep checking if it is working as required. When the saddles start to lift the vehicle, check again if the saddle is in the right position and readjust it. Lift the load to the preferred height and then place jack stands. 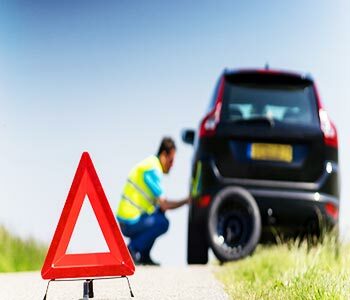 Never go underneath the vehicle before placing the jacks at the specified points. Open the open release valve, which is done by twisting the handle in the counterclockwise direction. The saddle will lower the load, which should be in slow motions so as not to cause shock load on the jack stands. Take out the jack stands and then lower the load completely. How to Choosing the Best Automotive Floor Jack? Construction: Consider what the floor jack is made of, as this will determine how strong and durable it is. The Powerzone 380044 is made of aluminum and steel. Rated Lift Capacity: You should check the maximum weight capacity that the floor jack has. This is advised by the weight of your vehicle. Lift Range: Again, this is determined by the frame design of the vehicle. Check the minimum and maximum height of the floor jack that you intend to buy. The design of the Vehicle: Look at the design of the vehicle in terms of the casters, wheels and the height of the saddle. Lifting Speed: Most hydraulic floor jack will have a quick lifting system. This is an essential consideration as well so as to be sure how long it will take you to raise your load to the maximum height. 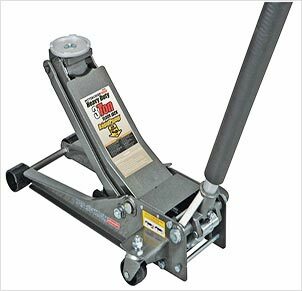 The Powerzone 380044 is an all-round garage jack that has all the features that you would need a high quality hydraulic car jack. There are other models which have similar features, but the Powerzone floor jack stands out due to its light weight and low price. This will give you the best value for your money. 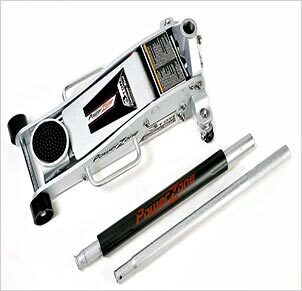 We highly recommend Powerzone 380044 3 Ton Aluminum and Steel Garage Jack to all user who wants a solid floor jack. If this article is useful to you, please feel free to leave a comment and also share it far and wide so as to inform other users of this good quality floor jack.